The local onion and garlic farmers has long been intimidated by imported produce coming from other countries, making the competition stiff as the prices of the imported ones are more cheaper than the local produce. Aggravated by illegal smuggling cartels, imported onions and garlics swarm local markets killing the local allium farming industries. 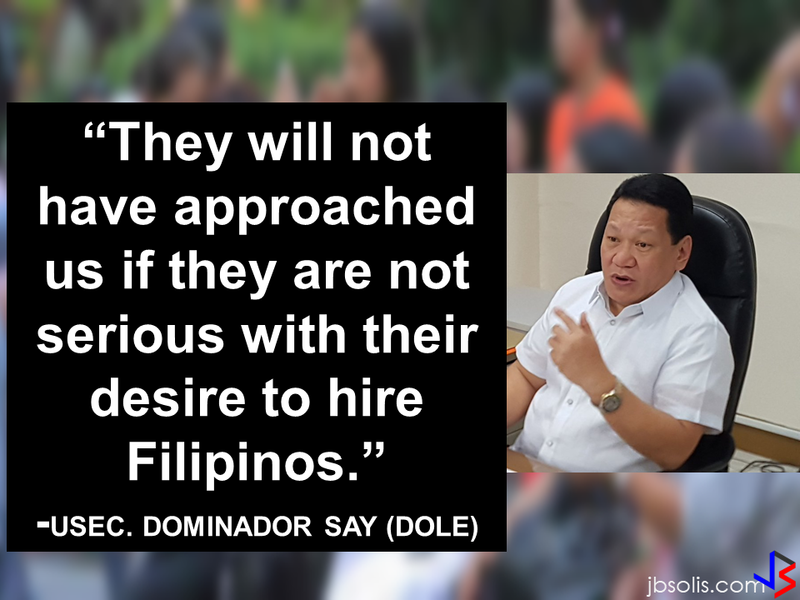 The Duterte administration shows concern to the local farmers even from the beginning of his term, and the growing concern that involves local farmers demand more attention to prevent the local agriculture from dying. The country's onion and garlic farmers, who have long been oppressed by cartels and smugglers, may finally be seeing the start of their liberation as four more giant food firms have pledged to buy directly from them. Presidential Adviser for Economic Enterprise Joey Concepcion sent a text message last night from Paris saying that four more giant food and supermarket firms have pledged to buy direct from Filipino onion and garlic farmers. 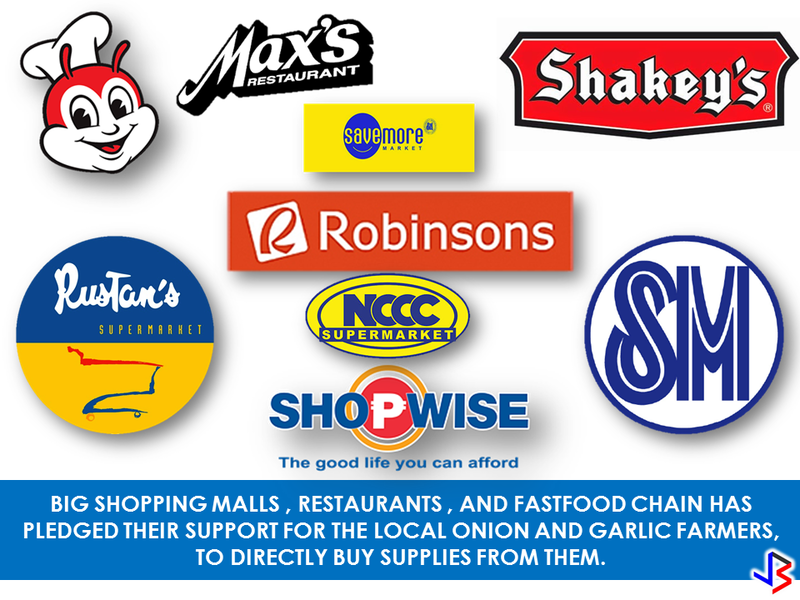 Jollibee, Shakey's, Max's and Robinson's Supermarket have joined SM Supermarket, Rustan's, Shopwise, Savemore and Mindanao-based NCCC Malls in the advocacy to support the country's onion and garlic farmers. It all started Friday morning when DZRH's Damdaming Bayan hosts Joe Taruc and Melky Regonan linked me up with a leader of onion farmers from Bongabon, Nueva Ecija who complained that the buying price for their produce was so low that they would end up losing money again. 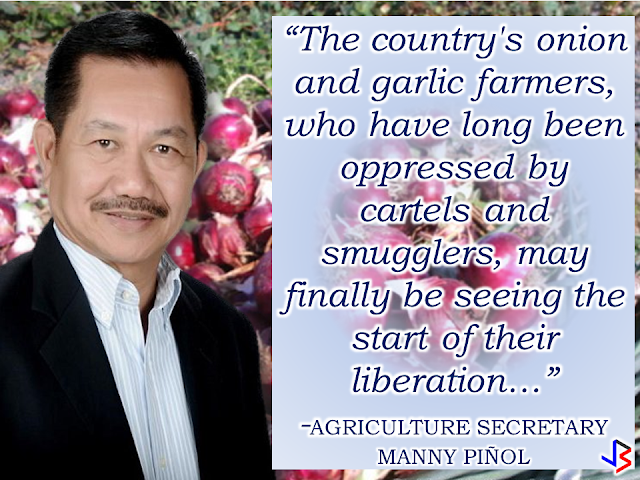 In an earlier post, I exposed the control by powerful and rich cartels of the garlic and onion industry in the country. This has been going on for years. Cartels and smugglers bring in huge volumes of alliums and flooding the market with the commodities during peak harvest season of onion and garlic to bring down prices. They then buy the farmers' produce at very low prices and then jack up the prices during off-harvest season thus creating a total monopoly of the onion and garlic market. Several officials of the Dept. of Agriculture were charged before the Ombudsman for their alleged involvement in this syndicated operations. On Friday afternoon, I called up Joey Concepcion and sought the help of his Go Negosyo Team led by Trade and Industry Secretary Ramon Lopez and private sector representative Ginggay Hontiveros to help in linking up the farmers with direct buyers. By Friday evening, SM's Tessie Sy, Rustan's Nonoy Colayco and the Lim brothers of the Mindanao-based NCCC Supermarkets have pledged to buy direct from farmers. "Thanks to all. I will meet with the onion farmers to check what they need to be able to consolidate their products and engage in a supply agreement with you. Offhand, I am looking at providing them with a working capital and transport equipment. What you are doing now is historic as this marks the start of the liberation of our farmers from the control of middlemen. God is great. May God bless you all." Indeed, the Alliums Advocacy marks the start of an effort to link up farmers directly with buyers. 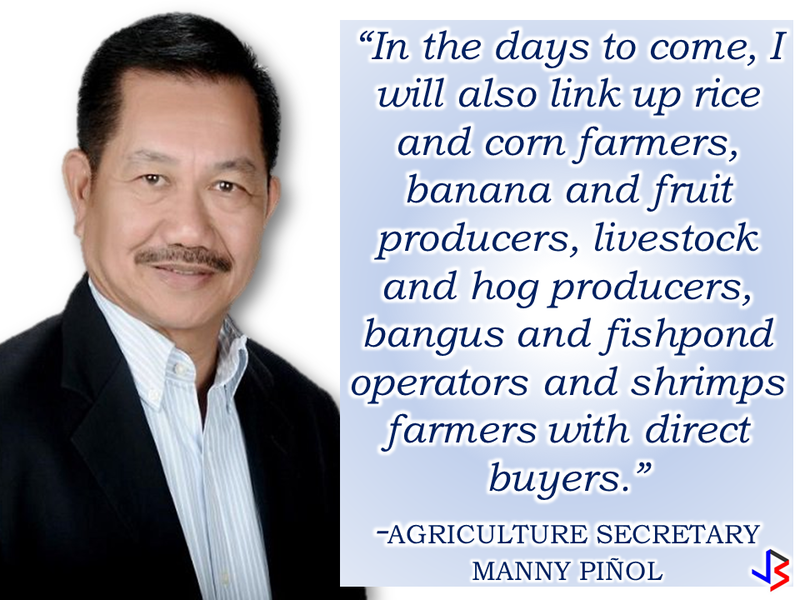 In the days to come, I will also link up rice and corn farmers, banana and fruit producers, livestock and hog producers, bangus and fishpond operators and shrimps farmers with direct buyers. Along with this advocacy, the Dept. of Agriculture will also institute measures to curb the smuggling of agricultural and fisheries products which undermine the interests of Filipino farmers and fisher folks. #Changeishere! #PresRodyCares! 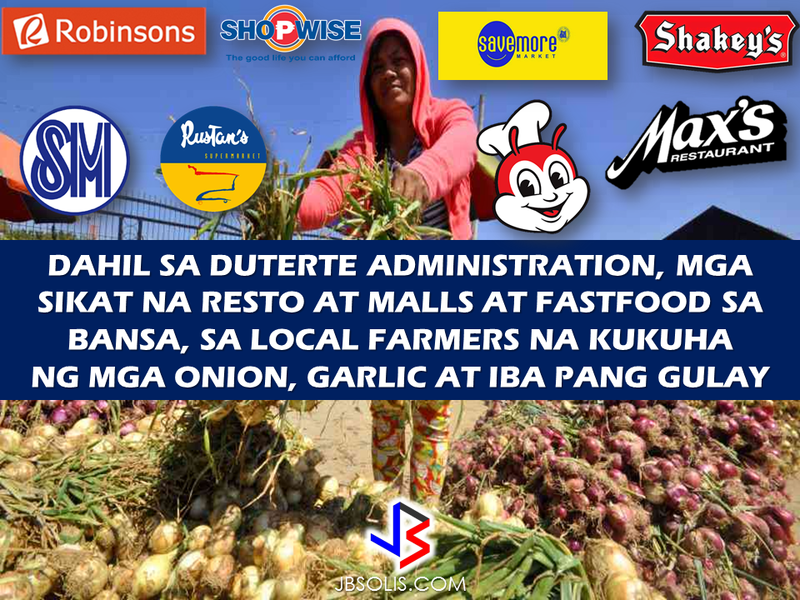 #DuterteDelivers! #StopSmugglingNow! #FarmersLiberationBegins!